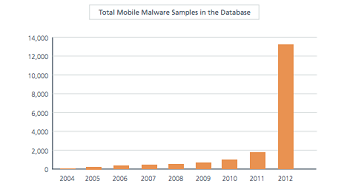 Approximately 85% of all mobile malware attacks since 2011 occured on Android smartphones. When it comes to the world of internet security and malware, being the biggest fish in the sea also makes you the biggest target. Such was the case when Windows operating systems dominated the PC landscape in the 90s, and such is the case today in the mobile sphere with Android phones. The platform is fast becoming the mobile operating system of choice, but its rampant growth combined with its open source nature is an ideal breeding ground for virus and malware distribution. Tracking reports by security firm McAfee have revealed that in the last year, malware breaches have grown by an astronomical 700%, putting the Android at approximately 85% of reported malware instances. The attacks themselves range from standard email and SMS sending malware, to mobile botnets and trojans. Thumb drive, password-stealing, and URL-based malware have sample increases in the millions. Mobile ransomware in particular has become an especially prominent tool for cybercriminals in recent months. Ransomware infects a mobile system to delete photos and personal files, with the demand that users pay an amount of money to restore their phone back to its original state. So why is Android seeing such high malware figures compared to Apple's iOS? Part of the reason, just as for Android's piracy figures, is the open-source nature of Android but there are other problems. Google's official malware scanner Bouncer, which scans apps to ensure they are not malware, only scans programs that come through the Google Play Store. Any malware coming from third-party sources, which is very common on an open-source platform, won't be inspected by Bouncer. My instinctive reaction to this is that users should be better educated on how to make their devices more secure, but frankly, a 700% increase implies that steps should be taken to make the platform itself more secure. Google may already have some solutions in the works, including the recent updates to the Android Billing System, which should make purchase-related security upgrades much easier to implement.